The Everglades were magical—a maze of canals snaking into the surrounding swampland, a wild with monster alligators everywhere. 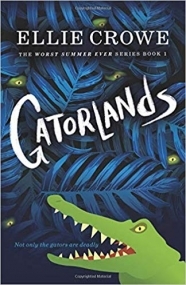 How, then, was Megan supposed to just sit back and not explore the place?The airboat ride out into the thick gray water-world was so beautiful, so calm—how quickly things had changed. She had begged Adam to take her and her siblings out on the boat. But where were Sydney and Luke now?Lost, like she was, of course, but hurt? Dead? It was her impulsiveness that had gotten them stranded out here and drew the poachers’ anger. She wrapped her arms more tightly about the baby orangutan in her lap. How could she live with herself if something happened to them? Would she even have the chance?The now-familiar sound of someone or something sloshing through the muck reached her ears. Who or what was coming? The orangutan bared his teeth at the unknown, and she closed her eyes. She didn’t want to know the answer.She was too injured to climb out of this hole, and calling for help could attract them. One way or another, she knew she wouldn’t be getting out of here alone. It was only a question of who would find her first.